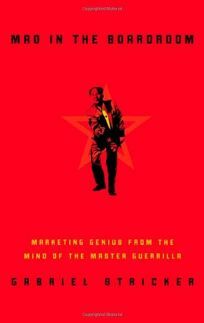 Stricker, who's identified as""a young marketing expert"" on this book's back cover, asserts that before Steve Jobs, Ben and Jerry, and Richard Branson, there was Mao Tse-tung. He""may not have been a capitalist at heart, but he sure knew how to wage an underdog war against a better armed, better equipped, Goliath opponent."" Stricker presents a pocket-sized, heavily illustrated--and heavily satirical--handbook to understanding the Chairman's approach to business. Tongue-in-cheek commentaries on companies who embrace guerrilla concepts (including Apple, Skyy vodka, Swatch and HBO) accompany photos of Mao in action (e.g., superimposed onto a 1984 Apple ad). Stricker then offers mini-profiles of guerrilla leaders, from RCN's David McCourt (like Mao, he""has a vision for the future"") to The Body Shop's Anita Roddick (she""believes in fighting clean""). A curious amalgam of humor and business advice, Stricker's book should appeal to little guys thinking about going up against the big dogs.